Ian Darby looks at the growth in both audience numbers and advertising costs, thanks to the rising use of social media. There’s a certain charm to be found in watching the Super Bowl live on television from UK shores. Pull those curtains tight on a cold Sunday night, turn up the fire and crack open that can of Bud in anticipation of the rough and tumble ahead. In the US, of course, charm is hardly a word you would associate with the Super Bowl. It’s gigantic, all-encompassing, awesome. And, in the face of the forces of fragmentation, it continues to grow as a media and advertising event. Sunday’s Super Bowl XLVII in New Orleans, which will see the Baltimore Ravens take on the San Francisco 49ers (and Beyoncé perform the half-time show), is expected to attract record levels of advertising revenue from record numbers of advertisers paying, according to forecasts, $3.8 million for a 30-second spot. The broadcaster CBS has the rights for this year’s big game (coverage alternates between the major networks) and advertisers will include the regular Super Bowl supporters such as Pepsi, Bud Light, Chrysler and Coca-Cola. Samsung also returns to the ad breaks following its 90-second 2012 spot, while the food brand Wonderful Pistachios has commissioned a 30-second ad featuring the Gangnam Style rapper Psy. 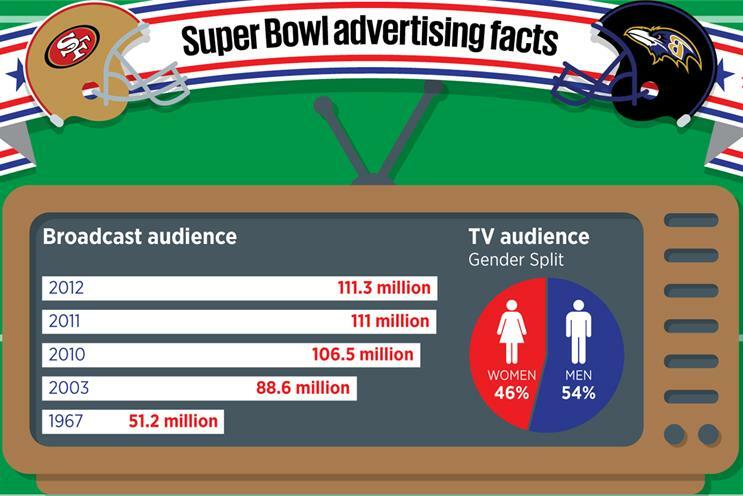 Advertisers are willing to pay increasing amounts for Super Bowl spots while the broadcast audience continues to rise. They are also looking to capitalise on an increase in related PR and online opportunities. In common with the US election build-up and coverage, there is a trend for increased use of social media and "two-screen" activity during the Super Bowl. As with other major live event programming, this has tended to complement rather than disrupt the broadcast experience. Twitter and Facebook use during the Super Bowl broadcast has grown, but this has clearly not had a negative impact on the broadcast audience. There is also evidence that advertisers are using social media to create a second audience for their ads: sharing of Super Bowl ads via social networks increased by 129 per cent between 2011 and 2012, according to research from Unruly Media. The same research also shows a clear trend towards longer Super Bowl spots to take advantage of this growing online audience. It claims that the top ten-rated Super Bowl ads in 2012 were on average 83 seconds long – 31 seconds longer than in 2011. Perhaps the biggest impact social media has had is in prolonging the period in which advertisers’ Super Bowl commercials can "live". Some 73 per cent of the top 20 most-shared Super Bowl ads last year were launched online before the day of the event, the research says. This year, Coca-Cola and its agency, Wieden & Kennedy, have created a teaser site, cokechase.com, that asks people to vote on one of three outcomes to a commercial. Ads also live on after the event. The majority of online "shares" of Super Bowl ads occur more than a month afterwards, meaning a longer shelf life for commercials – a factor that is likely to encourage advertisers to support the broadcast. In short, the Super Bowl broadcast highlights, in exaggerated form, the trends that are in play with UK "event" programming such as The X Factor. It looks like those cosy nights nodding off in front of the gridiron are here to stay.